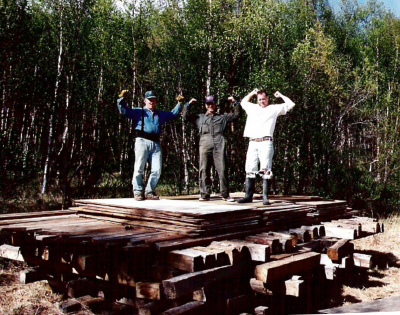 A group of volunteers were assembled in the summer of 1994 in what would be come the first of many public service projects for the re-vitalization of Crow Village. Lisa's Brother-in-law John Flynn along with john's uncle Dan came in to help David. 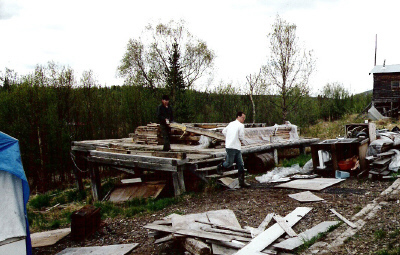 The purpose of this event was to transport many of the logs utimately used to build the big house in Crow Village from the spot they were originally used - David's father's house in Chuathbaluk. 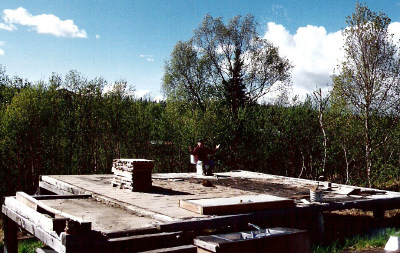 Chuathbuluk is about 18 miles upstream from Crow Village. 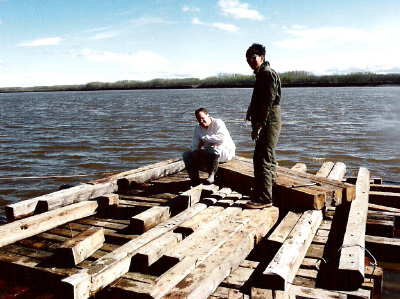 The basic process was to disassemble the house in Chuathbuluk, assemble the logs on a makeshift raft on the Kuskokwim, and float the contraption down to Crow Village using the boat we affectionly call "The Crow" for braking and steering. As is frequently the case with Crow Village projects, there was a certain amount of uncertainty on whether the plan would actually work. 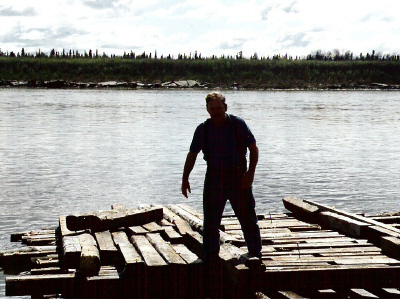 Logs were locked together snug with the spikes that were still in the logs and they had to kepp pushing the raft out as it grew since the raft kept sinking from the additional weight. 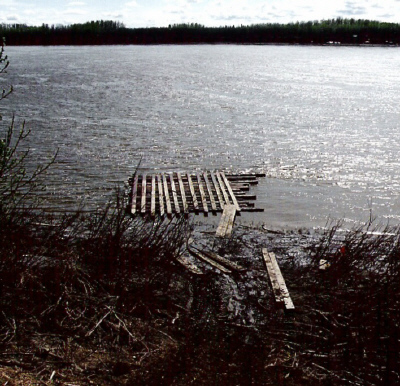 Additionally, the level of the river kept lowering during the whole process. 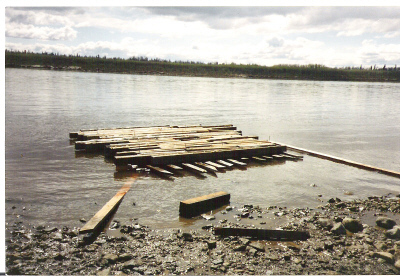 The raft was 50% under water once all the logs were loaded. 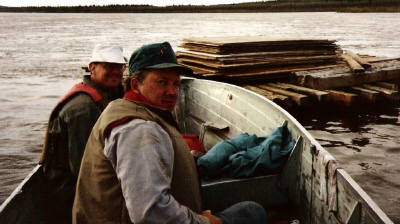 As you can imagine, it was a tricky procedure ramming the massive rig into the right spot along the muddy shore at Crow Village, but fortunately for those who would have to transfer the logs up the bank, they scored a bulls-eye. 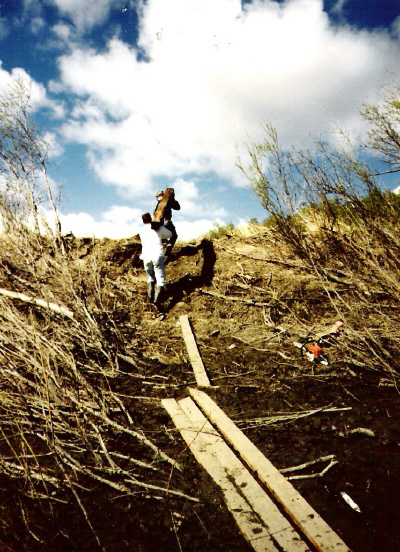 Pictures from the activities are below.